This task must be softer: soft as mashed potato, soft as candyfloss, soft as a cuddly Cthulhu. Like many other great and noble players who have completed this task, I turned to the softness of fabric and thread. 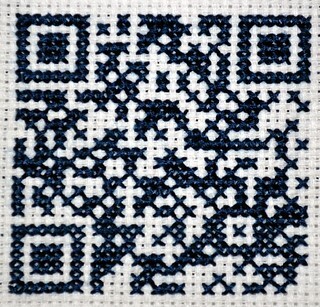 After learning to cross-stitch space invaders and Pac-Man ghosts a few months ago, I learnt to cross-stitch QR codes, by initially following some of the instructions from Instructables: QR code cross-stitch patch. 2. I opened the file in GIMP and added a grid. Lining up the squares properly so it would fit in the grid seemed too difficult, so I created a new file with a grid and copied each of the square colours onto the new grid. I then printed out the new grid. 3. I then got a piece of white aida cross-stitch fabric, and some dark blue thread (as I was lacking black), and started to sew a line at a time. I started sewing it while at the Royal Festival Hall, in London. I was at a theladiesloos meet, and one of the people there was cross-stitching a bug, and the other was altering a zombie-related t-shirt so that it would fit her better. A girl, a teenage girl, told me what I was sewing was cool. A group of people started singing and I caught the word, "hell". I presumed they were singing a religious song, telling me I was going to hell, but no, it turned out they were protesting against Shell. 5. I then attempted to use ironable adhesive to stick it to a scarf. It fell off. I have now stuck some fabric glue on it also. It does actually work as a QR code still. If someone scans my scarf with a QR code reader, they will end up back at the task to make it soft. The task is now soft.